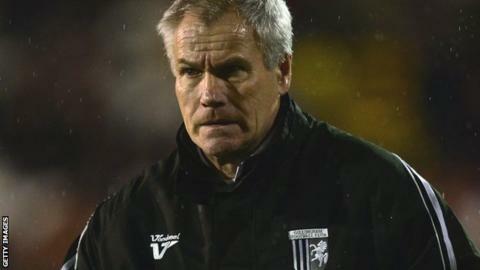 Gillingham manager Peter Taylor has been sacked after 14 months in charge of the League One club. A statement on the club website said Taylor, who turns 62 on Saturday, has been "relieved of his duties with immediate effect". Former Gills boss Andy Hessenthaler, 49, has been placed in caretaker charge by chairman Paul Scally for Saturday's League One game at Port Vale. The Gills are currently one place and two points above the relegation zone. Scally told BBC Radio Kent he "hadn't intended to sack" Taylor on Wednesday but that a phone call with the one-time England boss had prompted him to act. "He called me and as a result of that conversation I wasn't prepared to let him carry on with the team," Scally said. "There are a number of things that aren't right and we think we should be doing differently. There is never one reason why a manager loses his job. "He was doing a decent job but I do believe it is right to have someone else running the team now." "Peter Taylor had been under considerable fan pressure for a large part of this season, something which chairman Paul Scally admitted had become a concern. "A bright start was followed by a run of just one win in 11 league matches, and though recent results had picked up, the team find themselves just two points above the drop zone. "The timing may be a surprise but, with the transfer window on the horizon, it now presents an opportunity for a new man to make the team his own." Taylor was appointed interim Gillingham manager in October 2013 following the dismissal of Martin Allen and was handed the job until the end of the 2013-14 season a month later. The former Leicester, Hull and Crystal Palace boss agreed a two-year deal with the Kent club in the summer. Taylor targeted a mid-table finish in pre-season but the Gills have found themselves in the lower reaches of the table since September. Having previously led Gillingham to promotion to the second tier after spending the 1999-2000 season in charge of the club, Taylor was given the backing of chairman Scally in October. "I told him on Monday I was concerned about the huge adverse public response to him. He was getting some serious abuse," Scally added. "I think Peter was finding the fan pressure quite intolerable. It's very sad for me because I like Peter and he is a good friend of mine." Hessenthaler, who was player-manager of the Gills between June 2000 and November 2004 and had a second spell in charge between May 2010 and May 2012, was assistant manager at Priestfield Stadium. Scally, who has been Gillingham chairman since 1995, has put no timescale on the appointment of a new boss but says the club need "a younger, more flamboyant manager". He said: "I don't think 'Hessy' would want the manager's job but I haven't had that conversation with him. "I'm fairly clear as to the type of person I want. Just because I fancy a person doesn't mean they want to come and work at Gillingham. "What is important is not the time it takes but trying to make sure we get the person we feel is most appropriate for the team we have got. "You look at the likes of Gus Poyet and Gianfranco Zola who have played the game and gone on to become good managers. We need that type of person and I will certainly be giving it some thought."